HGIExport reports download error (Word, PDF, and Excel) with IE 7 and 8. Note: This article applies to Microsoft Internet Explorer versions 7 and 8. In versions 9 and 10, the option mentioned below is already turned on. The default setting of Internet Explorer will cause a browser refresh during certain circumstances in HQMS. When exporting a report, the user is stuck in a loop when downloads are allowed. When checking out a document, the checkout will have to be cancelled and the document will need to be checked out again. The problem occurs on the computer when a yellow bar is displayed at the top of the screen that says that Internet Explorer has blocked this site from downloading files. To facilitate report exports and checking out documents, a default setting needs to be changed in Internet Explorer. The setting below will clear this up. 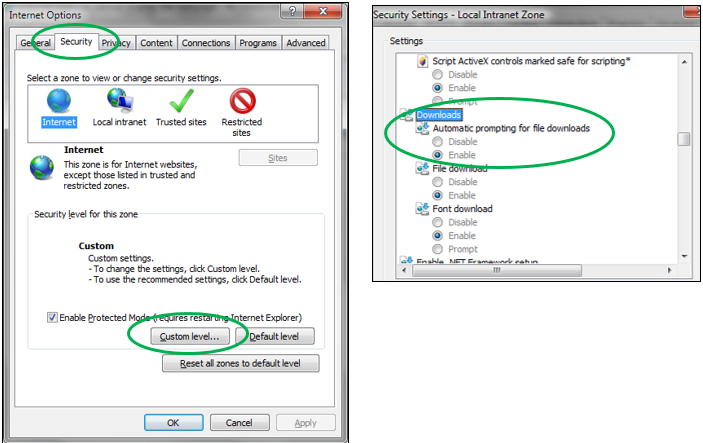 In Internet Explorer, click Tools, Internet Options. Click the Security tab and click the Custom level button in the lower right. The first setting is Automatic prompting for file downloads. Set it to Enable. Click OK, click Yes, click OK.